School Play was the outcome of a public art commission associated with the construction of a new school building for a primary school. School Play consists of two parts. Firstly a permanently sited graphic element on school yard consisting of painted circles and arcs on the tarmac and secondly a series of colour photographs. This graphic element on the schoolyard has a dual function: it is a play apparatus for use by the children in their self-directed playtime activities; it also functions as a kind of set or stage for the creation of a series of photographs shot from an elevated position at playtime over an number of months. 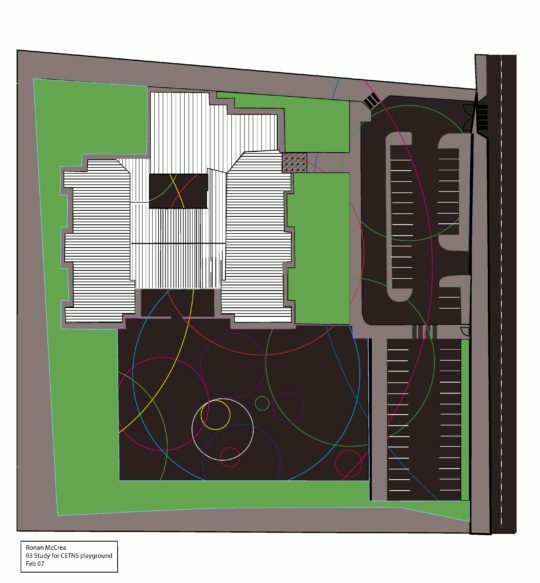 Study for School Play (2007) Plan showing school yard with markings in relation to school building. A edited series of 12 colour photographs are permanently installed in the corridors and common areas of the school. Each photograph is printed by hand from 6×7 colour negatives, full frame and without any cropping. Each photograph is 112 x 92 cm. School Play also explores the possibilities of creating a photographic portrait of a collective body or community, while also addressing that community as a primary audience, and also engaging with a wider audience whereby photographs from the School Play series have been exhibited in gallery contexts. The photographs refer to the street photography of Alexander Rodchenko, whose pictures of crowds and street scenes, and the dynamic compositional techniques of elevated and angled points of view, which became intentionally inhered into the representation of new (revolutionary) subjectivities. This reference resonates with the representation of “new subjectivities” in formation within this educational context. This notion is further is inflected by the specific “Educate Together” model of this particular school. (A model of multi-denominational ethos and democratic management that is at odds with traditional church-based models of educational patronage.) As such this site can be (literally) seen as part of a larger discourse over church-state relations, multiculturalism, pluralism and possible formations of a post-theocratic republic. Central to the development of this project was a period of research and observation into the play activities of the children, where particular attention was focused on those times of self directed and self organised play, which range from elaborate group games to individual daydreaming. These games are highly regulated by the children themselves, in that a lot of effort is invested into establishing the parameters and procedures for each activity, but these regulations creatively and rapidly shift, dissolve and coalesce from moment to moment. In this sense the circles are utilitarian – acting as boundaries and markings for un-prescribed play. Scholarship that influenced this project include play theorist Brian Sutton Smith, in particular his major work, The Ambiguity of Play (1998). Sutton Smith proposes theories of ‘play’ are rooted in seven distinct “rhetorics” – the ancient discourses of Fate, Power, Communal Identity, and Frivolity and the modern discourses of Progress, the Imaginary, and the Self, over which various discourses and disciplines of knowledge intersect. In this way Sutton Smith sees any particular society’s conception of what play might signify or its social function might be, as offering valuable insight in its values and ethical construction of that society. In another sense, circular markings become a set – in the sense of a stage set, or a film set – for everyday action (a resonance acknowledged in the title of the project). The circles and arcs mark out and bisect up the pictorial frame. Random actions become relational. The play becomes choreography. Miniature dramas and moments, both individual and collective become related through spatial arrangement. (No directions are given from photographer to subject.) Everything is random, like the Brownian motion of particles, or perhaps one of Canetti’s Crowds. When working in a school, one becomes aware of a society in microcosm. The photographs recall Rodchencko’s street photography in the composition of angles and perspectives and something of his utopian notion of a new subjectivity revealed by new perspectives. 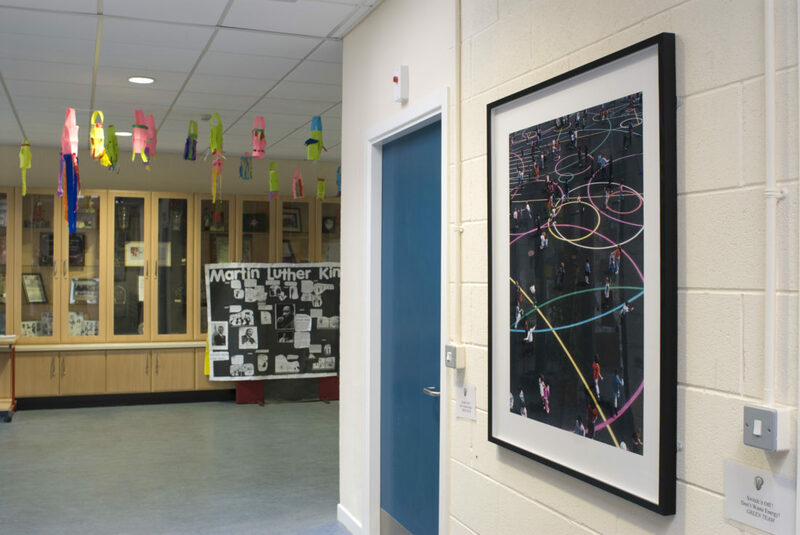 Permanent installation of design on school yard and series of 12 photographs in Castleknock Education School, Dublin 15. Completed Feb 2009. AUTODIDACT Green on Red Gallery, 15 April – 14 May 2011. (solo exhibition) A second series of prints were produced in 2011 School Play # 13 – 18 (ii) (2009/11) all C-type photographs, mounted on 2mm aluminium, in an edition of 5. Dimensions: 66 x 64 cm. framed. Ronan McCrea, ‘Sequences Scenarios & Locations continued’ (with a Response by Felicitas Thun) in MaHKUzine. Journal of Artistic Research, Utrecht, Issue #7/Summer 09. Brian Sutton Smith, The Ambiguity of Play, Harvard University Press, 1998.